I volunteer as a School Reading Partner through my local school district. My job? Reading one-on-one each week with two first graders I’ll call Eva and Nick. Although the program provides reading materials, the selection is limited. So each Friday, I bring in a big bag of books hoping some will appeal to my seven-year-old friends. Not easy! They may struggle a bit with reading, but they are sharp and discerning and have very particular tastes. Not so much the puns and clever language that I appreciate (oftentimes it goes over their heads), but silly, slapstick, CRASH-BOOM-BANG humor. And, of course, they want a good story with escalating drama. 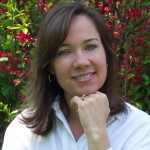 Eva, in particular, loves identifying patterns and predicting how the story will unfold (she’s usually spot-on). A few winners? 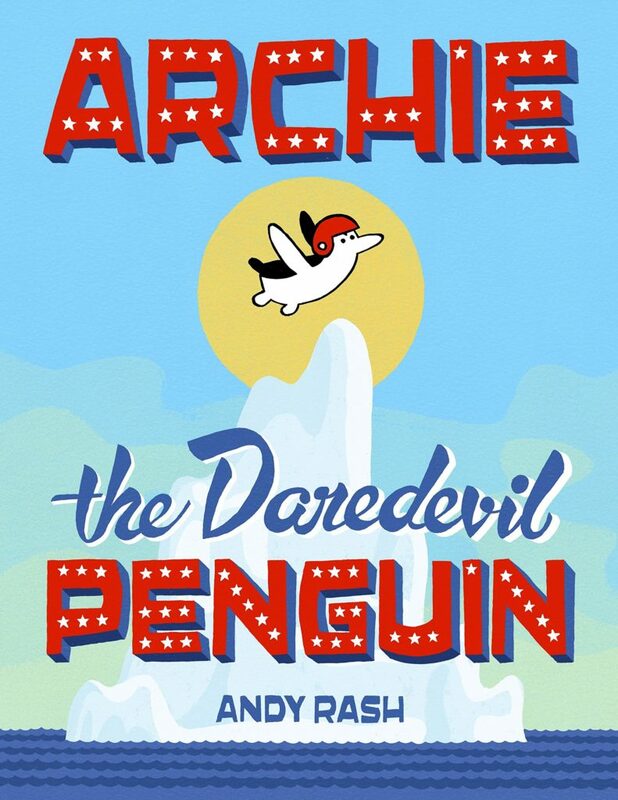 They got a big kick out of Archie the Daredevil Penguin by Andy Rash . 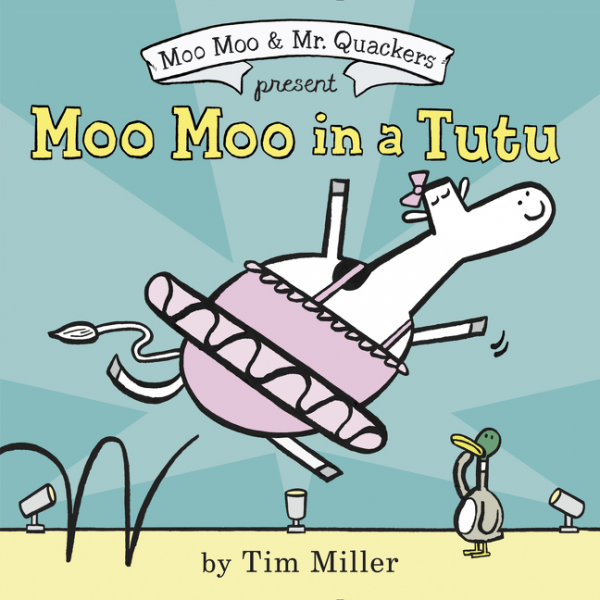 . .
and Tim Miller’s Moo Moo in a Tutu —featured in this PBB post—was also a big hit (so much so that Nick has asked me to bring it back multiple times). 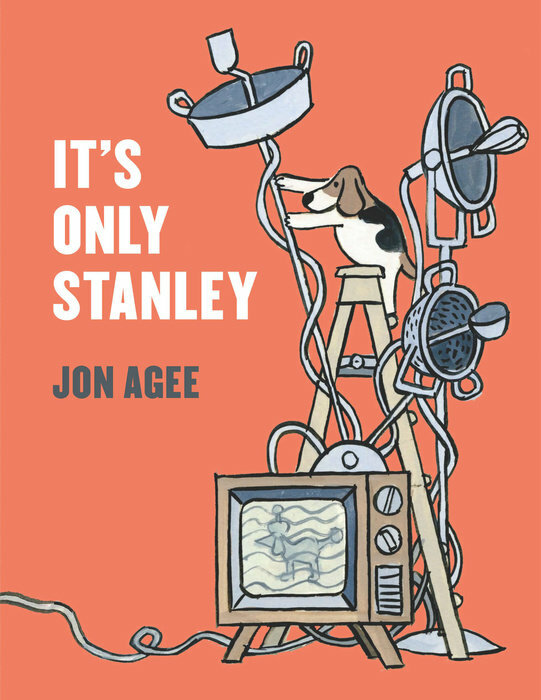 And they loved Jon Agee’s It’s Only Stanley, featured today. Absurdity-within-Normalcy Humor. 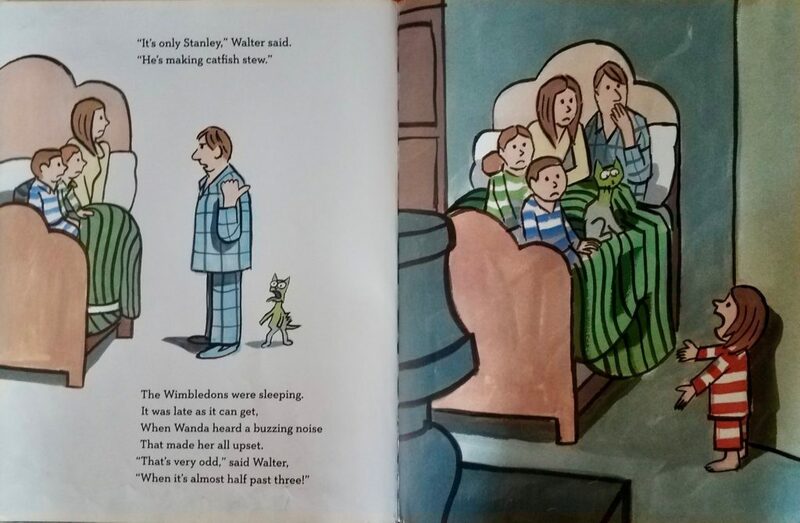 Walter and Wilma Wimbledon are trying to sleep, but—one by one—their kids alert them to a series of strange sounds and odors. Each time, Walter dutifully drags himself out of bed to investigate, then returns to calmly reassure everyone that “It’s only Stanley” clearing the drain or fixing the oil tank. Just normal stuff, right? Except that it’s the middle of the night . . . AND Stanley happens to be a dog—one with an extraordinary aptitude for science, tools and tinkering. Visual Humor. 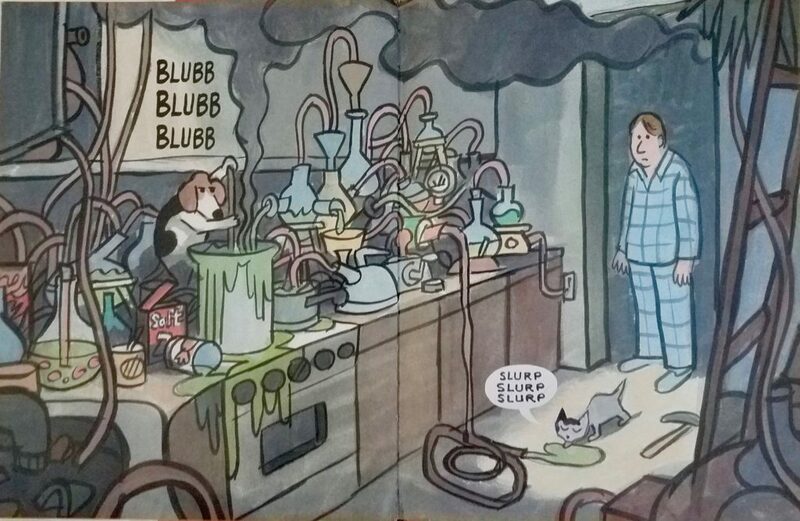 An ordinary beagle with a mad scientist bent offers plenty of opportunities for funny illustrations. 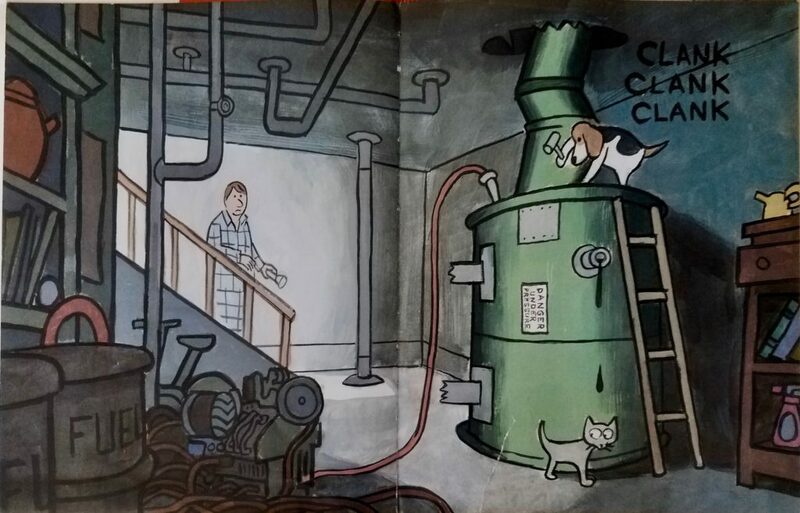 But there’s also a visual side story running through the book: Max, the cat, as the unwitting victim of Stanley’s experiments—lapping up toxic spills, getting dripped on and shocked. (Eva, in particular, found the cat illustrations hilarious.) In addition, the perfectly timed page turns and double spreads amp up the drama and laughs. Language Humor. The alliterative family names—Wilma, Walter, Wendy, Willie, Wanda and Wylie Wimbledon—are funny and fun to say, as are the plentiful sound effects: CLANK, BLUBB, SLURP, BZZZ, SPLISH, SPLASH, SPLOOSH, KAPOW! 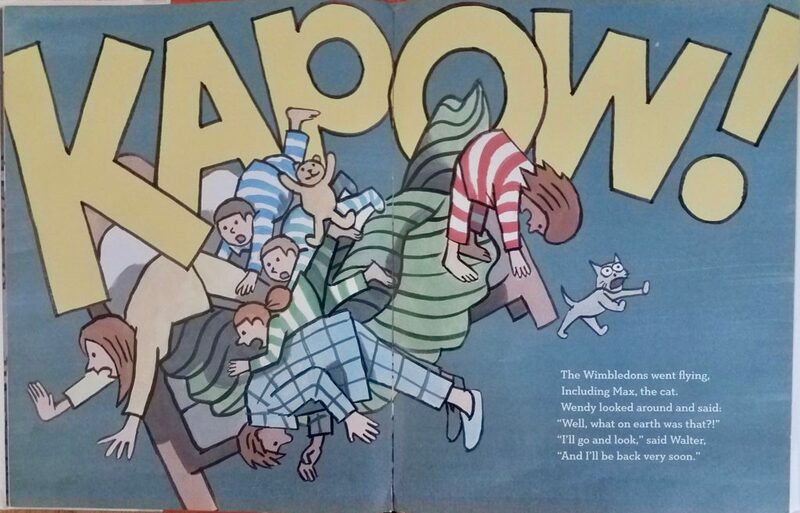 Besides all that, the book is written in clever and perfectly-rhythmic rhyme, which propels the story forward and lets kids anticipate what’s coming and fill in the blanks. Jon Agee has been doing this for a long time, and is a master of the picture book form (we’ve featured other Agee books here and here). Want more? There’s a great interview with him at Authors Revealed. Any books made you laugh out loud lately? For kids or adults? I’d love to hear. humor, It's Only Stanley, Jon Agee, Linda Ashman. Bookmark. Thanks for sharing the types of humor! I agree that kids know what they like; it doesn’t matter if it has a shiny sticker on it or not! So true, Tina! Thanks for reading! Funny stories are my kind of picture books, too! Mine, too, Cindy. And they’re definitely a hit with the kids! I love It’s Only Stanley: such a fun read aloud with rollicking rhyme!! Yes, he did such a fabulous job with the rhyme, didn’t he? Plus, it stars a dog. What could be better? I’ll have to check out this book ASAP! Looks so fun and in rhyme!! Yes, Tracy–definitely check it out. I bet you’ll enjoy it! Great post! My son and I enjoy humor as well. These aren’t recent but ones I can think of are: I’M NOT A CHAIR, DOUG NEEDS GLASSES, and BE QUIET. Thanks so much, Ashley! I’ll definitely look for these for my reading buddies! Thanks for this wonderful post! Laugh-out-loud picture books are my favorites. Here are three more I love: Ragweed’s Farm Dog Handbook, A Beginner’s Guide to Bear Spotting, and Glamourpuss. Wonderful! Thanks so much, Claire–I’ll definitely try these! Thanks for the book recommendations, Linda. I also read with students in a local school – 9 different kindergartners. Finding books they like is most definitely a challenge. I’m with you about lugging in bags of books to improve the choices. When all else fails, I bring in a book with the word “poop” in the title. Ha! Tried and true bodily-function humor. And, wow, 9 different kids! That must be REALLY challenging! I have read Its Only Stanley over and over and it just keeps getting better and better! I know what you mean, Terri. I keep noticing new things each time! That sounds really funny, Janet. Thanks so much–I’ll check it out! Just tossed this onto my holds list. Thank you for sharing! I love Jon’s work, but this one slipped my radar. I whole-heartily agree with your assessment that kids have their own value hierarchy that is unique from our own. It was so refreshing to my soul this morning to be reminded of that fact. It’s for the kids. We get bogged down with theme and message and language and structure and archs and everything in between, when we should concern ourselves more with the ones our stories are intended for–certainly not for adults and the least bit for stuffy awards committees. It was interesting how you broke down the differing forms of humor present in this story. Lots of thoughts percolating. Thank you! Well said, Brian! Glad the thoughts are percolating. I bet you’ll love the book. Let me know. I, too, love It’s Only Stanley, but you provided much more insight into it. Agee is amazing. I have a few new favorite laugh out loud books – We Don’t Eat Our Classmates, and especially for writers, No Boring Stories. Thanks for the recommendations, Beth! I’ve got We Don’t Eat Our Classmates here in my office–I plan to try it with the kids next week. Fingers crossed! You had me convinced when you said your second-grade friends enjoyed the books, (Not to mention they appealed to me) but when you said IT’S ONLY STANLEY was a rhyming book, I wrote down all three titles to get at my next library visit. Thanks!! Potato Pants by Laurie Keller. I had to buy it as soon as I read it. Oh, yes. Such a wacky, funny book! Thanks, Michele! I’m familiar with It’s Only Stanley, and I love it, too! Isn’t it fun? Thanks for reading, Kathy! Oh, three great book recommendations! I can’t wait to read them all, especially It’s Only Stanley. I, too, read weekly to two first-graders and bring along books from my own stash or the library. Thanks, again. I bet you’ll enjoy it, Lisa! Amazing all they types of humor found in one book! Thank you for sharing It’s Only Stanley and the other humorous story recommendations! You’re welcome! Thanks for reading, Judy! Great book suggestions! Absurdity does seem to be a favorite for kids. I love books that make me laugh outloud! Me too, Angie! Thanks for reading! I loved the humor in It’s Only Stanley. Agee makes it seem so effortless. A recent book I found pretty funny was Truck Full of Ducks by Ross Burach. This looks wonderful. Thanks for showing it to us. I’m taking a three semester PB writing class. I love it but can get lost in the nuts and bolts and forgets the kid listeners/readers.